How do you know how many workers are illegally deprived wages and what those wages are worth? It’s tricky to quantify. Wage theft – workers not being paid the legal requirement for the hours they work – takes a few different forms. Say you work overtime, but you don’t get paid time-and-a-half. Or if you receive a “salary” that puts your hourly rate below minimum wage. Or if you work on commission, but never receive it because of a loophole in the contract. Often workers move on with life rather than try and recover their lost wages in court or by complaining to labor authorities. Many workers stay in the shadows – perhaps unaware their employer has skirted the law by shorting them pay. Rocky Mountain PBS I-News looked at the amount of wages that the federal Department of Labor was able to recover for workers through an investigation of violations under the federal Fair Labor Standards Act from 2005 to 2014. The department makes There’s even an app to check up on businesses in your area to see which ones have violated labor law. This covers cases the feds have scrutinized, but not ones that went unreported or weren’t investigated. 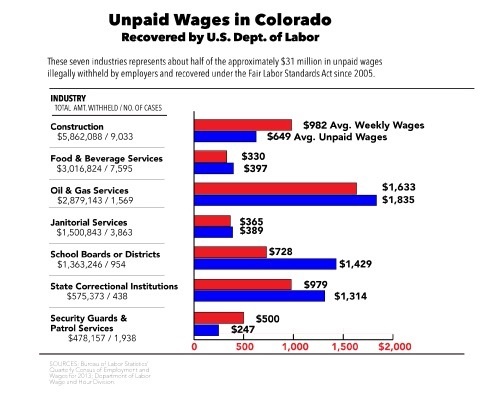 Federal labor investigations were able to recover $31 million in back wages for 50,000 Colorado workers from 2005 to present. During the same period, they were able to recover $1.4 billion for over 2 million workers across the United States. For each person helped, the amount of their unpaid wages may be relatively small – from a few hundred to a few thousand dollars – but those wages are far from insignificant on a personal level. The amount of illegally withheld wages can easily equal a week’s worth of pay, or more, according to the I-News analysis. For example, security guards earned $330 a week on average, according to the Bureau of Labor Statistics’ Quarterly Census of Employment and Wages for 2013. But our analysis shows federal investigators recovered $397 on average per worker that was illegally withheld. Workers in oil and gas services and transportation industries earned $1,633 a week on average, and $1,835 per worker in illegally unpaid wages were recovered.